I was so excited when I opened the door. We were new to the area, and living in a brand new neighborhood, so when I saw a girl about my age holding a boy about my boys’ age standing on my doorstep, I couldn’t wait to meet her. Excuse me for a minute, while MY. JAW. DROPS. TO. THE. FLOOR. I very politely thanked her (what else are you supposed to do in that situation??!! ), and then ran as fast as I could up the stairs to our playroom. Sure enough, my four year old boys were on the roof, zooming cars off of the edge. Somehow, they had figured out how to unlock a window, open it, then remove the screen, and climb outside. I called my husband immediately (after sending the boys to their room), and asked him to bring home extra locks for the windows, which he did, and we installed them that night. We needed to be able to use that room–the playroom–and I needed them to be safe. The next day, the boys were playing upstairs again, and all of a sudden an eerie silence hit me, which is code for TROUBLE. Would you like to know what I found? Two little boys, on the roof again, and those new locks sitting on the floor, just below the window. Those boys. I love their guts out. The next day I got smart. I set an alarm on the windows. P.S. We never had a playdate with our new neighbor. I like motivating and encouraging through positive reinforcement, and rewarding good behavior. I think it’s important to offer good consequences as well as the negative consequences, and this is one of the things we’ve implemented. 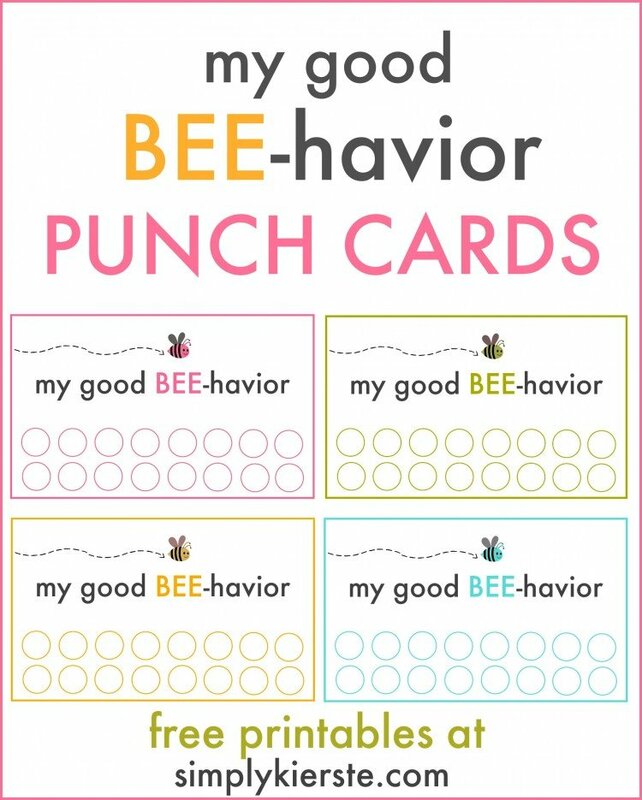 We’ve been working on our listening skills lately, and these punch cards are an easy way to keep track of all the good choices that my kids are making, recognize them when they do, and motivate them to do so. How does it work? Any time I see them making a really good choice–listening the first time, being kind to a sibling, going the extra mile, doing chores quickly without argument, etc.–I use a hole punch to punch out one of the circles. When their hole card is punched, they earn a trip to our family treasure box. Stickers, notebooks, matchbox cars, candy, and coupons for things like an extra piece of dessert are some of the things they can choose from. Or…they can save up their punched cards, and get something bigger, like a date night with mom or dad, or staying up late to watch a movie. It’s really simple, but it totally works with my kids. They’re kids, so of course they make decisions that aren’t the greatest (i.e. climbing on the roof), and those require consequences, and sometimes it can be easy to focus mostly on those, and the good things they do kind of lost in the shuffle. We’ve found that really looking for and noticing the good things they do build them up, and make it easier for them to make the right choices. *COPYRIGHT SIMPLY KIERSTE. NOT INTENDED FOR RE-SALE OR DISTRIBUTION. FOR PERSONAL USE ONLY. Your story made me smile but it must have been really scary, seeing your sons on the roof, twice! made smile…boys will be boys. we have a penny jar for catching them being good, but i like the punch card. I never thought I would hear that story from anyone else but me. We had the same thing happen, and the house was three story!! I about died and was so mad at my sons at the time. We laugh about it now. One’s a freshman in college and the other is a senior in high school. I’m so glad that there’s someone else who understands, and that you can laugh about it now! :) Seriously, these boys!!! You might find this hard to believe, but we also have 2 sets of twins! (8 total kids) and when we moved to our 3 story home we found our then 2 1/2 yr old boys on the roof (2nd story)…we’ve found them in the van before they should have been out of bed in the morning…..we’ve replaced countless toilets due to unknown objects being flushed & stuck. They’ve flushed goldfish; ruined most of our walls & carpets, and now that they are1st grade I get regular phone calls home from school. So far nothing has been lit on fire. Thank God. I am trying these punch cards for sure!!! Hahaha! so much love for my boys!!! I read your reply after just coming home from an all day, 8-5 ER visit – 2 ERs actually after being transferred to a pediatric unit out of town, because one of the twins swallowed his tooth fairy money when he woke up – 2 “gold” dollar coins! They ‘slipped into his mouth’ he said……oh my gosh! We are firing that tooth fairy and firing a new one that only gives out paper money from now on. I need a nap….and a glass of wine – but none in the house so I will settle for the nap! do yo have the kids hold on to the card or do you have them in the kitchen?